First, a comprehensive consultation lets both you and Dr. Dubrul know if you may have a chiropractic condition that can be helped through chiropractic care. If he finds that this is the case, he will then proceed with a detailed examination which includes a postural analysis, range of motion analysis and specific palpatory analysis. 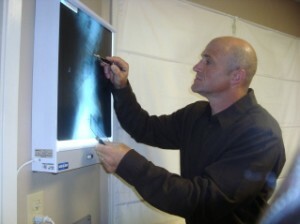 X-rays are taken on site only if needed. Following your evaluation, Dr. Dubrul will review your health history and examination findings and then sit down with you to discuss the results. This appointment is about one half hour in length. A program of care will be specifically designed and recommended, along with lifestyles changes that will enable you to reach your health goals in the most efficient and cost effective manner. At this juncture, we will give you your first adjustment if you choose. After you begin to feel better, you will make an informed decision about what you want out of your care program without ever being pressured to “come more often” or “stay forever.” That’s something else you’ll appreciate as a new patient with Dr. Dubrul: He leaves you in control. Dr. Dubrul believes that the healing touch should never become a controlling hand. So he lets you decide how often and how long to come for adjustments, and always keeps you informed of your options. Commit today to help your body heal and defend itself with a chiropractic program that leaves YOU in control. Upon entering our clinic we will greet you by first name and warmly welcome you. We will introduce you to every member of our staff that you will come into contact with. We will thoroughly walk you through any forms we need from you. We will thoroughly explain any out-of-pocket expenses prior to providing any services.